Noah, Lily, and Simon have been a trio forever. But as they enter high school, their relationships shift and their world starts to fall apart. Privately, each is dealing with a family crisis—divorce, abuse, and a parent's illness. Yet as they try to escape the pain and reach out for the connections they once counted on, they slip—like soap in a shower. Noah’s got it bad for Lily, but he knows too well Lily sees only Simon. Simon is indifferent, suddenly inscrutable to his friends. All stand alone in their heartache and grief. 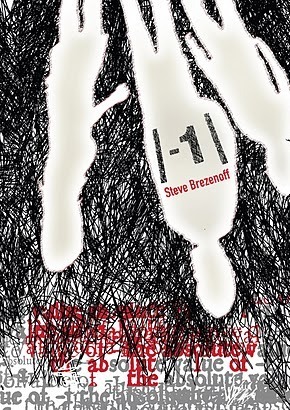 In his luminous YA novel, Steve Brezenoff explores the changing value of relationships as the characters realize that the distances between them are far greater than they knew. It's always been important to me to dive into books that deal with the gritty parts of real life. I think these are essential for kids, and I like to see how authors approach the subjects. Books that deal with younger characters have always had a draw for me. Especially when they deal with the subjects that most parents don't seem to want to broach with their children. It always seemed to me that kids will find the information that they are looking for one way or another, so wouldn't you rather it be accurate? At least if a book properly and effectively deals with a touchy subject, a younger person can get the information that they are seeking. Books like this have power. The Absolute Value of -1 does deal with some difficult subject matter. I find it only fair that I warn you that pot smoking, shop lifting and mild violence lie within the pages. Buried in there are also teenage feelings and confusion over love and lust. However as an educator I know that these big ticket items are, in fact, a part of most younger lives at some point. As much as we would all like to pretend that teenage lives are sugar and spice, that simply isn't true. As Simon, Noah and Lily each show respectively, your home doesn't have to be a specific way for you to begin to follow a certain path. Instead it is the individual experiences in a person's life that lead them to down one road or another. Told in sections from each character's point of view, this book shows us how the same set of moments can be experienced three different ways. It was fascinating to have that depth into each character's memories. Simon, Noah and Lily are each so different, and yet when you see the same story through each of their eyes you find that they have common links. Watching them grow, watching them make mistakes, it was as if there were real people right there in front of me. I think this is book perfectly embodies the concept of a "coming of age" story. What I loved about The Absolute Value of -1 was that it was raw. This was a look at the inner workings of these children, and their thoughts. I especially felt invested in Simon, and struggled when he struggled. I saw myself in him as he fought to break away from that which was defining him. I'll admit that Steve Brezenoff knows how to weave a story that draws you in and pulls emotions forth that aren't always easy to deal with. There were many moments where I found myself teary eyed, and others where I found myself so angry. This book touched me in a way that I can't quite put into words. Plain and simple, this story is beautiful. However if you're picturing lyrical writing and sweeping scenes, you're missing the point of this book. Truth is, The Absolute Value of -1 is a gritty, realistic read and that is what I adored about it. Steve Brezenoff has no qualms with diving into the darker parts of his characters' lives, and I think that is really important. Although this was a difficult read, I feel I came away from it a better person somehow. Recommended 100%.